Aluminum track with pins is intended to be used when stretch carpeting is being installed. Vinyl t-molding trim will snap into the aluminum track once the flooring has been installed. 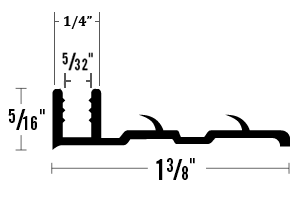 Vinyl t-molding trim is sold in 12ft sections, but the aluminum track is sold in 4ft sections. Make sure you are ordering the correct quantity of each item needed. 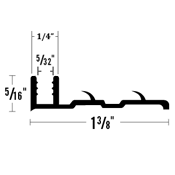 Vinyl t-molding trim base track is made in the USA. Install the aluminum track with nails or screws. Here is a selection of the vinyl t-molding trim that will work with the aluminum track base. We also offer aluminum track base without pins and vinyl track base. Take a look at this vinyl t-molding trim installation video. Aluminum track is the perfect product to make finishing your floor a snap. Order now.